A fresh campaign makes potential members take a second look. 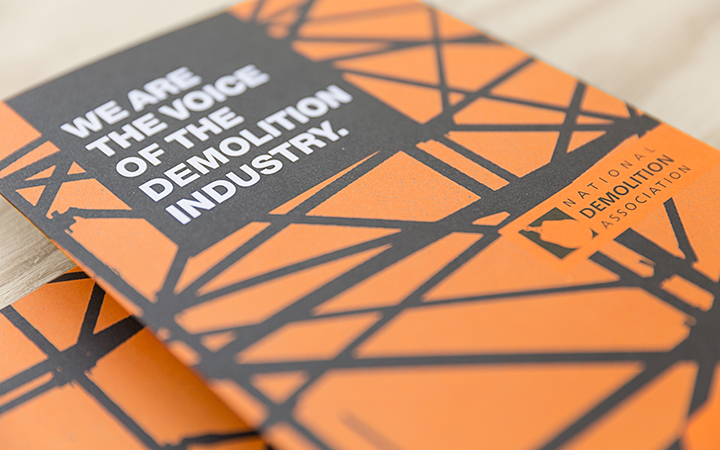 The National Demolition Association is the voice of the demolition industry, a non-profit representing more than 800 companies engaged in a wide range of demolition activities. The NDA provides education, advocacy, and current information on the latest technical advances in equipment and services to members while increasing public awareness of their $4.2 billion industry. Membership had been static. The NDA needed a new way to introduce themselves to students and potential members, connect with lapsed members and re-energize their base. Needing to increase and enhance the membership experience, they asked our help to revamp their membership communications. We set out to get the attention of three key audiences: current members, potential members and those who had slipped away. 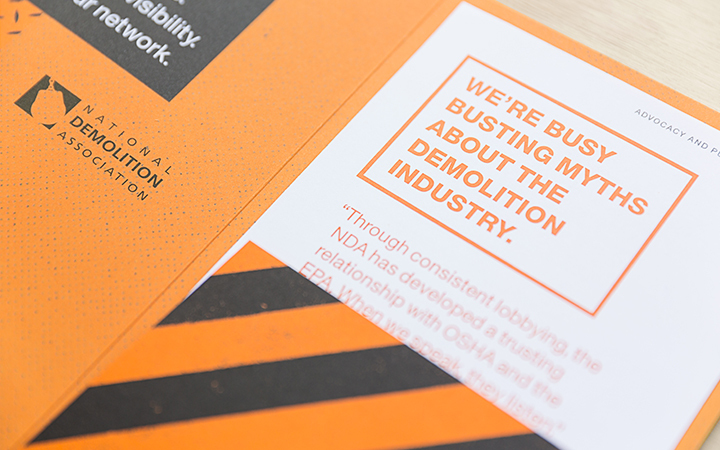 We needed to get the attention of busy demolition owners both small and large, to remind them of the tremendous accomplishments of the NDA and the benefits of membership. 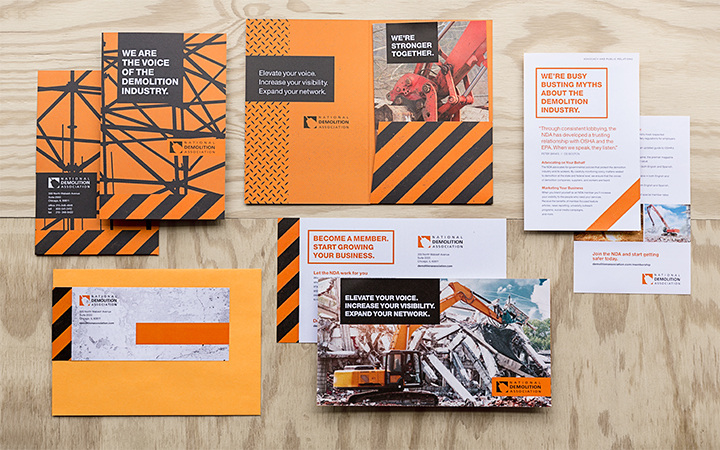 To appeal to a pragmatic and predominately male audience, we used strong headlines and powerful graphic interpretations of everyday demolition elements—cement, scaffolding, metal and safety stripes—along with the NDA orange to set the tone. We created a versatile communication system made up of a branded pocket folder that would retain a long shelf life. Seven topical information sheets allowed for customized messages to four different audiences (and they could be inexpensively updated). Everything fit nicely into an economical manila envelope with a branded mailing sticker. 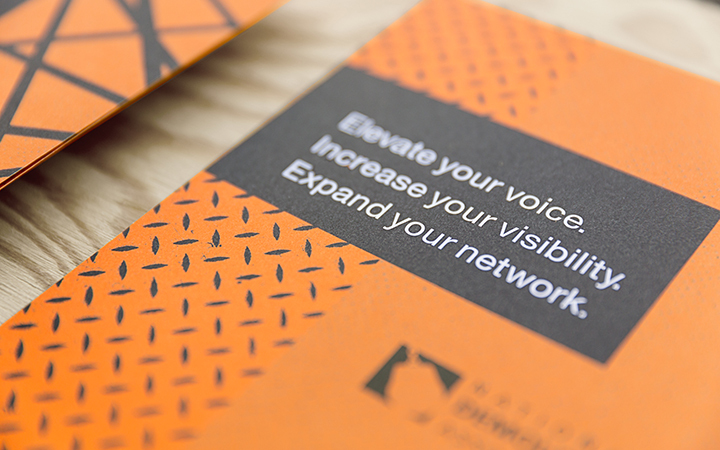 A huge postcard was designed to kick off the campaign, capturing attention and reminding busy owners and managers to head to the NDA website to sign up. 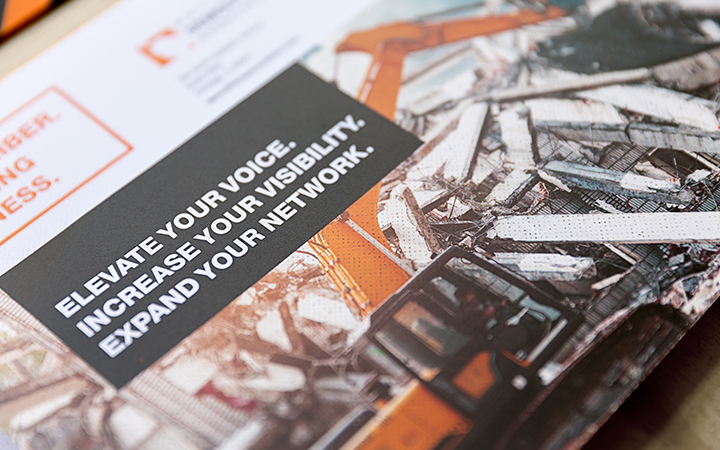 The final result is a unique and impactful membership campaign that breaks through the clutter and motivates people within the demolition industry to join together—to be stronger together.